I’m back at school after a 4 day weekend for Fall break. I really needed that break from school, but unfortunately one of my professors with no life decided it would be best to show everyone how much he hates his life by giving us a take home mid-term for the break. 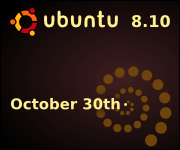 In other news, Ubuntu 8.10 is being released in just 18 days on October 30th! I added a little banner on the side to hopefully catch the attention of a few people who might be interested. Next Next post: Who likes all-nighters?